This week, a group of employees from Carolinas HealthCare System are in Guatemala for the official opening of the country’s most innovative, neonatal/pediatric intensive care unit. 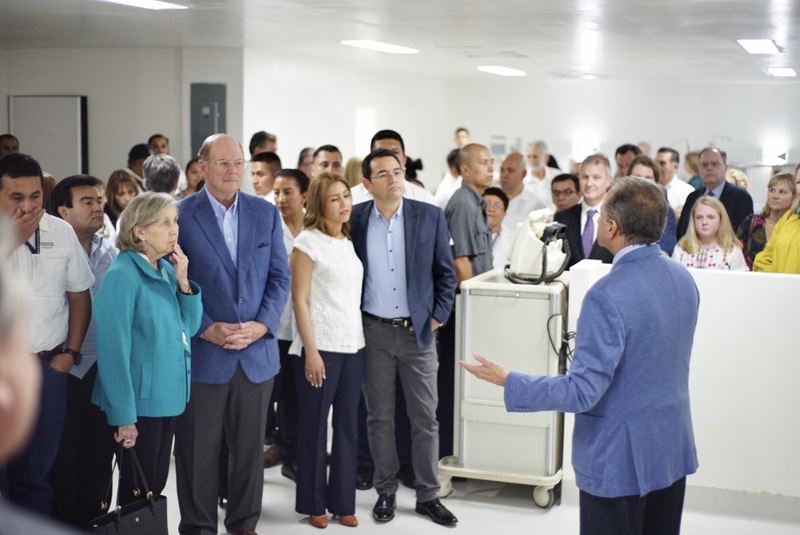 On March 16, the new 36-bed National Regional Hospital of Escuintla became the largest facility of its kind in Central America. It was created with support from the International Medical Outreach (IMO) program, a partnership between Carolinas HealthCare System and the Heineman Foundation. Follow our journey. Escuintla, Guatemala – March 17, 2017 Six months ago, nurses and doctors at Hospital Regional de Escuintla huddled around the infant son of one of the nurses. The young boy had battled pulmonary issues since birth and had now contracted pneumonia. Always focused on providing the best care they can, the doctors felt an extra level of pressure caring for one of their own. The doctors and nurses often slept in chairs next to the boy's bed to monitor him, wishing they had more and better equipment to treat him. That wish came true yesterday when the largest neonatal and pediatric intensive care unit in Central America opened at the Hospital Regional de Escuintla in Escuintla, Guatemala. According to Hospital Director Dr. Luis R. Falco, the staff at Hospital Regional de Escuintla treats 1,000 pediatric cases a year. With the opening of the new facility, the expectation is that number will triple. "There are many small angels all around us who can see what has been done here,” says Dr. Willy Menendez, the chief of pediatrics at Hospital Regional de Escuintla. "We will save many more little lives." The new facility will be named for Peggy Hynes, wife of Carolinas HealthCare System board member Jim Hynes. The Hynes family have been long-time supporters of the IMO program and made several donations toward the development of the new unit. Jim and Peggy Hynes, along with several members of their family, attended the opening and were recognized by President of Guatemala Jimmy Morales and his wife, First Lady Hilda Patricia de Morales, who attended the opening. "We are excited and humbled we've had the opportunity to make a difference here," Jim Hynes says. "This is all part of what Carolinas HealthCare System does as a part of our mission." The equipment includes ventilators, patient monitors, incubators, infant warmers and cribs. In addition to the equipment, Carolinas HealthCare System physicians will provide consultations and special training to the providers in the new unit. IMO has also provided virtual communications equipment for education, training and communications. "Being able to work with the doctors and nurses here has been incredibly inspiring and rewarding," says Carolinas HealthCare System’s Levine Children's Hospital Pediatric Intensive Care Unit Medical Director Dr. Dwight Bailey, who is leading the training and education exchange. "The people here are so incredibly dedicated and work with what they have. I know how much this equipment will mean for them and their patients and how important this work is for both of our organizations." You can follow the journey on Carolinas HealthCare System’s Facebook and Twitter pages, as well as Levine Children’s Hospital’s Facebook, Instagram and Twitter pages. Read the blog entries from day 1 and day 2.